The community of Klösterle is a rather small settlement in the Arlberg region of Vorarlberg and well-known all over Austria for its excellent skiing facilities. This would apply to pretty much every community in the entire Arlberg region - but Klösterle is particularly touristy. In 2007, an impressive 140,000 night arrangements have been sold, with a clear focus on the skiing season and the skiing-hub of Stuben, which is part of Klösterle. Klösterle is different to most of its neighbouring communities in so far as it has other aspects to it than just skiing. It is the most important community in the Klostertal Valley and serves as an administrative and educational centre. This has been the case for quite some time - therefore, you can actually do a bit of sightseeing in Klösterle, which is not granted at all in the usually rather ugly skiing resorts of Western Austria, which are often about as authentic and original as a Las Vegas casino. Let′s start with some history: The Habsburgs ruled over Klösterle from Tyrol or Freiburg im Breisgau for many centuries. It was an poor and unpleasant area with no fertile soil, no important trade routes and no skiing industry. The few people who lived in the area of Klösterle during the Middle Ages and Modern Age until well into the 19th century did have a hard time making a living from agriculture. As a result of the Napoleonic Wars, Klösterle turned Bavarian in 1805. Nine years later it was returned to Austria, where it remained until today. The economy took a change to the good around 1900, when the first skiers arrived at the Arlberg and established the new and fancy sport here. With tourism apparently ever growing, Klösterle is now a prosperous place and it is hard to imagine it ever being poor and uninviting. If there is anything uninviting about it today, it is the new money people from all over Europe that come to spend their skiing vacations here every winter. 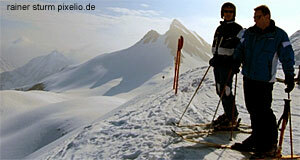 Especially Klösterle′s hamlet of Stuben is one of Austria′s trendiest and poshest skiing resorts. Ignoring the people, you will also find superb slopes in the area. In terms of sightseeing, you should have a look at the Theresienkirche Church in the hamlet of Lange. It was built in 1929 and designed by the architect Hans Fessler. Here you might recognize the importance that Vorarlberg plays as an experimental ground for modern Austrian architecture - the people of Vorarlberg have a reputation for brave architectural innovations. Otherwise, try to just walk around in the village. During the summers, you can enjoy some hiking or mountain biking. Otherwise, all sorts of summer sports area available. Attractions nearby include the other towns: Pettneu, St. Anton, St. Christoph, Lech and Zürs. For a slightly further drive, go to Landeck or Imst. Days with bad weather might be well-spent in Tyrol′s capital Innsbruck.